Lance Armstrong's confession made top headlines this week. After years of vehemently denying all allegations of doping, and suing anyone who dared tell of his practices, he finally admitted to the lie he has been living. This from the man who is described on his own website as "one of the most recognizable and admired people of this era." He recently appeared with America's favourite talk show host, and admitted to winning seven consecutive Tour de France's through drug use. Oprah: "Did it feel wrong?" Oprah: "Did you feel bad about it?" Oprah: "Did you feel in any way that you were cheating?" Lance blew it big-time. His wins were on the big screen, but now his sins are on the big screen. As the Good Book says, "Be sure your sin will find you out." Truth is leaking out after years of hiding. He admits that the damages wracked by his life of lies are colossal. The classic French tale Les Miserables weaves a story of a man with more depth of character than Lance. Jean Valjean, a criminal turned kind-hearted mayor, hears that another man is about to be erroneously sentenced for Jean's crime. His response? “If I speak, I am condemned. If I stay silent, I am damned!” So, he chose to speak, exposing his own sin, appearing in the courtroom to allow the innocent man to be freed. Victor Hugo's drama broke onto the big screen again recently, with resounding themes of how mercy and grace overcome sin and law. The story never gets old, because we all see ourselves somewhere in the story. We hope we're Jean...not Lance. 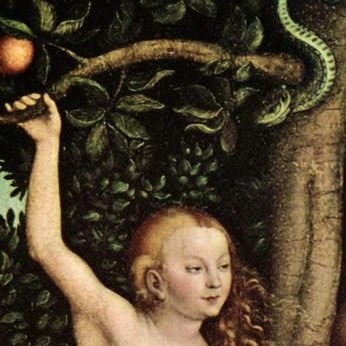 God exposes sin. He exposed Lance. In fiction, He exposed Jean. You can see it as an act of God's sovereignty, justice, or holiness. The Light bursting into dark places and Truth replacing lies. 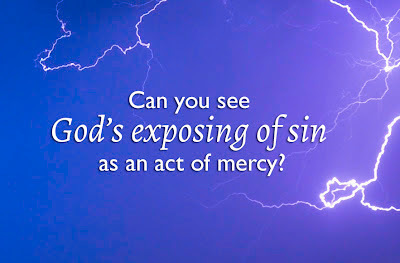 But can you see God's exposing of sin as an act of mercy? My friend told me about a dating couple who were sinning sexually. God knew. But their parents didn't know; their friends didn't know. But it was not long before they realized that everyone would know what had been going on behind closed doors. They got pregnant. My friend pointed out that this exposure was due to God's mercy. Their sin was brought to the fore, offering them opportunity to confess, and forcing them to admit to their families what had been going on. (How many a white-clad bride has been impure, but hidden that knowledge from everyone? Secret sin seems to have a tighter grip than blatant sin.) In making their sin obvious, God showed kindness. He was shining light. He is the Light. He says, "Walk in the light." 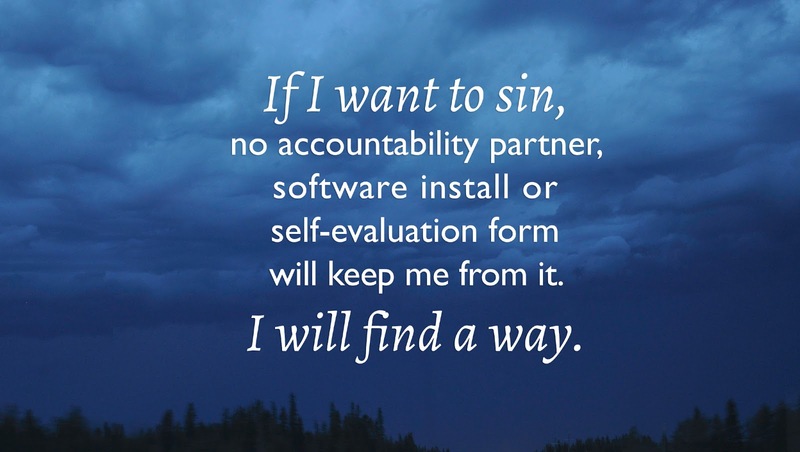 I have had a problem during some seasons of my life: my sin is not enough exposed to others. The sins of my heart are often insidious sins that lurk just beneath a well-behaved exterior. The Spirit and the Word certainly rebuke me, if I am willing to listen. (Indeed, Timothy said that the Word exists for teaching, rebuking, correcting and training.) But at times I wish for a human voice speaking, too, echoing what the Spirit is already saying. Sometimes I have to admit my sin to someone else because it involves them. Often the other person excuses me, saying, "Well, we all make mistakes." Or, "I didn't even notice your [insert sin here]." Maybe they think they're doing me a favour by going easy on me; it sounds really nice of them. But what I really need is for them to go to g0spel basics with me. We need to talk about the seriousness of my sin (whether they subjectively felt sinned against or not) and the holiness of God. Then we can talk about the graciousness and forgiveness of God. We can't skip the truth that sin is wrong or we won't appreciate the goodness of the g0spel. The best of friends aren't necessarily the ones who remember birthdays, help you move or house-sit for you...though I like those friends, too. The best of friends are the ones with backbone. My ten fingers would probably be enough to count the people who have rebuked me personally, spiritually. Those episodes stand out starkly in my mind because they are so rare. Once, I was in a math classroom with a teacher; another time I was talking on the phone with a friend while making my supper. One such rebuke from over ten years ago still stings, because it called out a sin that I still struggle with to this day. "Faithful are the wounds of a friend, but deceitful are the kisses of an enemy." My "best" friends in the truest sense are those who care enough to risk wounding me, who shine light in the darkness. We have systems to fight private sin. It has become trendy to have specific accountability partners. There is software that will report to a friend if you look at inappropriate web content. Once I was given a list of character traits to develop, a self-evaluation form to fill out, and a superior to report to. Such systems may have their place, but they have one major flaw. They cannot overcome the blackness of sin. Only the work of God can. This heart has been described by an accurate Source as being "deceitful and desperately wicked." 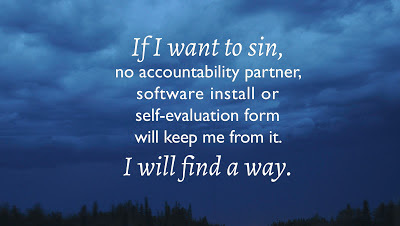 I know that if I want to sin, no accountability partner, software install or self-evaluation form will keep me from it. I will find a way. And to quote Lance, to me this is "scariest." So, I have a new request of the Father in 2013. It is not something that I have asked for specifically before. I am not sure what His reply will look like. But I am praying specifically that God would not allow my sin to stay hidden. I am praying that He will expose my sin, even that He would big-screen it to others if that's what it takes to bring change of mind and heart. For His mercy is evidenced not only in the pardoning of sin, but in the revealing of sin to a deceived heart. Sweet, sweet mercy. "Who can discern his errors? Forgive my hidden faults." "Come...let us walk in the light of the L0RD." I felt my heart grow nervous as I read your request for this year...what courage this takes to pray such a thing. Thank you for your writing and for being such a consistent example (through what you share here)of a woman who fears God.